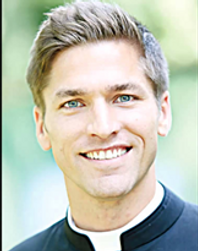 Father Chase Michael Hilgenbrinck is a former American professional soccer player. He is most notable for walking away from his professional career to become a Catholic priest. His parents raised their children as Catholics bringing him and his older brother, Blaise, to church each and every Sunday, where both sons served as altar boys at Holy Trinity Church in Bloomington, Illinois. Father Chase played soccer for University High School in Normal, Illinois. He made the United States Under-17 national team, before moving on to play for Clemson University, where he was a three-year starter, playing on the same defensive line as future U.S. senior national team fixture Oguchi Onyewu. After graduating in 2004, Father Chase was undrafted by Major League Soccer (MLS) despite an admirable college career. Claudio Arias, the Chilean soccer coach at nearby Southern Wesleyan University, suggested going to Chile where he thought he could help Chase get a contract. Father Chase signed with Huachipato of Chile's top division, but was loaned out to lower division club Deportes Naval. He eventually moved on to second-division club Ñublense and helped them to achieve promotion to Chile's top flight. In all, he spent four seasons in Chile, with three different clubs, and grew to become a star player. He joined the Colorado Rapids in early 2008, but was waived during the pre-season without making a senior appearance after the Rapids needed to clear salary cap space for other acquisitions. Two weeks later the New England Revolution called, and after a two-day tryout, the Revolution signed him on March 28. Father Chase's last game was on a Sunday, July 13, 2008, at Gillette Stadium in Foxborough, Massachusetts when the New England Revolution faced Mexican club Santos Laguna in a SuperLiga game. In the summer of 2007, the vocation director for the Catholic Diocese of Peoria, Illinois, sent him an extensive application packet. He had to write a 20-page autobiography and submit responses to a series of essay questions, in addition to a background check and fingerprinting. In December, the day after he returned to the U.S. following the end of the soccer season in Chile, he went through an entire battery of testing. He took five written exams in one day. Father Chase retired from soccer on July 14, 2008 to enter the Catholic Mount St. Mary's Seminary at Mount St. Mary's University in Emmitsburg, Maryland in order to become a priest. He was ordained a priest in the diocese of Peoria on May 24, 2014. He served as a parochial vicar for St. Anne's Catholic Church in East Moline, Illinois, as well as one of the chaplains at Alleman High School in Rock Island, Illinois. As of June 8th 2016 Chase is now posted at St. John's Catholic Newman Center at Champaign, Illinois.